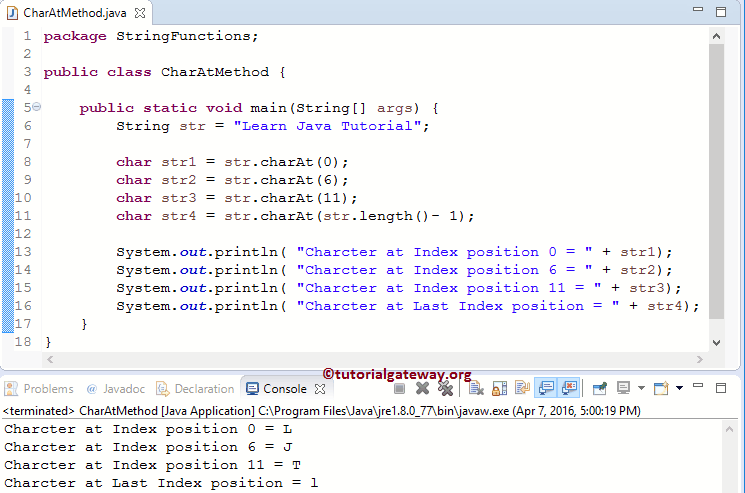 The Java charAt method is one of the Java String Method which is used to return the Character at specified index position. In this article we will show you, How to write charAt in Java Programming language with example. TIP: The index position of the Java chartAt Function will start from 0, Not 1. The basic syntax of the charAt in Java Programming language is as shown below. The Java chartAt Function will return the Character from String_Object at specified Index_Position. If we specify the Index position out of range, then chartAt Function will throw an error. The Java string charAt method is used to return the Character at given index position. In this Java program, We are going to find the same. Following statements will find Characters at index positions 0, 6, 11 and store the characters in str1, str2 and str3 variables of type char . NOTE: For Java charAt method, you should count the space as One Character. In the next line we are using the length function to find the string length. From the above code snippet you can observe that, we are subtracting one from string length. Because, length of a string will count from 1 to n where as index position will start from 0 to n – 1. In this string charAt Java program, We are going to ask the user to enter Y or N. Based on the user entered character we will display the message using Java charat. The following statement will ask the user to enter Y or N character and next, we are assigning the user entered value to letter variable. Next, we used the If Else Statement to check where the character at index position zero is y / Y or not. NOTE: we can use the lowercase method to convert user input to lower also but to make the code easy we are going in standard way.